I recently heard about a Brit whose cookbook has been an underground sensation among meat aficionados for years, garnering accolades from the likes of Anthony Bourdain, and whose name is mad English. 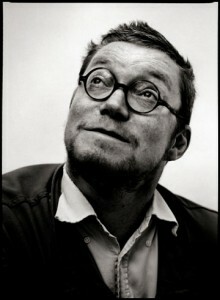 He is the reigning Viscount of Charcuterie, Fergus Henderson. An adherent of the waste-not-want-not axiom, Henderson runs things at St. John Bar & Restaurant in London and his book, The Whole Beast: Nose To Tail Eating, was republished in 2004 by ecco, an imprint of Harper Collins. I picked up a copy of TWB and read it cover to cover in one sitting, my own jowls stretched in disbelief at Henderson’s vision, ready to implement some of Henderson’s more innovative ideas to my cooking. When I came back to Tantre, I found a second copy sitting, spine corrugated, already on one of the farm’s many bookshelves. It’s the kind of book you need multiple copies lying around the house. I reread it the other day, incredulous at the depth and deftness with witch Henderson approaches cooking in general and the snout-to-tail methods in particular. And how he could make dishes involving pig tails appealing. He is a modern day Escoffier. His book looks at a meal much like the Beatles would approach an album—as a cohesive unit with a beginning, middle, and an end, where disparate elements complement one another and the whole is greater than the sum of its parts. The book brings to the readers’ attention the range of flavors encompassed in a single animal. Henderson is sure to balance a carnivorous recipe with meat-free dishes. Read the titles of his dishes and you might be repulsed (Stuffed Lamb’s Hearts anyone?). Read the descriptions and you might find your mouth water. Go ahead, I dare you. Fergus Henderson proves there’s more to a name than meets the eye. Even if it’s a mad English name.